When Paul Petrino in late 2012 took on the challenge of reviving a University of Idaho football program that had been spiraling down ever since the giddy high of its go-for-the-win-two-point-conversion victory over Bowling Green in the 2009 Humanitarian Bowl, he found a football desert, a team with a ton of needs. When Reuben Mwehla emerged as a second-team KingCo pick from an undefeated Bellevue High School Washington state champion ranked fifth in the nation, the Vandals were probably not his first choice to keep his impressive football roll going. But as his career as an Idaho receiver tapers to three or possibly four games, if the Vandals can qualify for a bowl, Mwehla can look back on what he is convinced was the right decision at the right time to become the first player to sign with the Vandals in the Petrino era. With a win over Coastal Carolina Saturday, Idaho’s 16 seniors can match the 11 Kibbie Dome victories posted by the four-year classes of 1999, 2010 and 2011, spanning the years in which the Vandals have played FBS football. In this group, the first guy still stands out. “He’s just a special young man,” Petrino says of Mwehla. “He works extremely hard at everything he does. He does everything he can for the team. He’s always team first.” In Mwehla’s final home appearance, “I would love for him to go out there and have a big game.” For his senior year, through nine games, Mwehla has 18 receptions for 213 yards and two touchdowns. Even though he was a product of the elite Bellevue High program that won 11 state titles in 16 years before it was derailed, and even though he trained at the controversial, hard-charging Ford Sports Performance in Bellevue, Mwehla didn’t bring a football-first mentality to his decision about where to go to college. What sold him on the Vandals was the family atmosphere the coaching staff projected – a big deal for someone who acknowledges he grew up without a father figure – and the respect the coaches showed his mother on his recruiting visit to Moscow. Which is not to say Mwehla ever felt coddled. “We worked hard every day I was here. They pushed you the way you are supposed to be pushed,” he said. 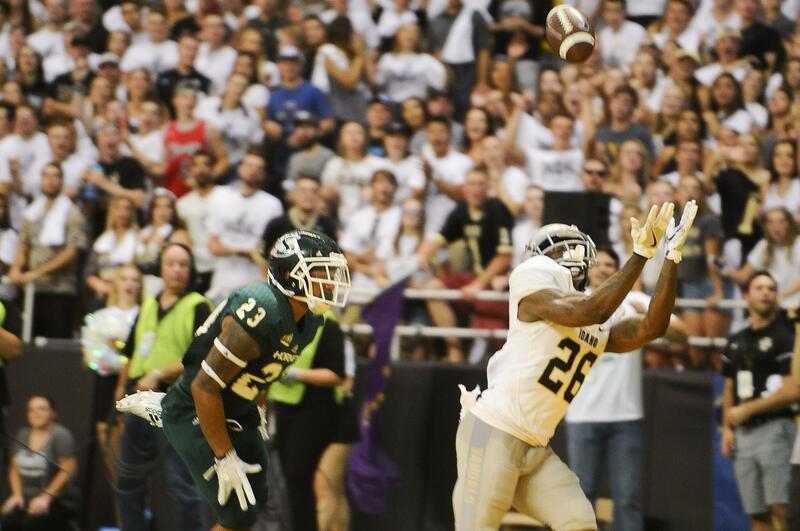 After a redshirt year he played mostly on special teams in 2014 and made his way into the receiver rotation the following year, when the Vandals left behind back-to-back one-win seasons to win four games. The Vandals completed their turnaround last year with a nine-win season crowned by a victory over Colorado State in the Famous Idaho Potato Bowl. Published: Nov. 16, 2017, 9:15 p.m. Updated: Nov. 16, 2017, 9:18 p.m.